Whist de-decorating houses of their holiday coverings all over Arcadia Saturday, I came across several peacocks and peahens wandering about in a few yards. 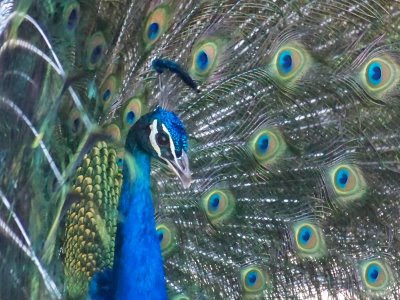 This particular peacock - Harold - was engaged in attracting an utterly disinterested peahen. Nice photo! Harold is beautiful. Leaf strewn driveways have always been, in my experience, a place for good byes. Not so much a place for "helloooooo nurse!" Coincidentally, I've always wanted a peacock named Harold. Harold needs to know the three rules of real estate....location...location...location! Harold may be handsome, but his sense of style leaves a lot to be desired. I hope he figures it out soon!